Start your review of David Porter. "I was happy with service.."
Service was great finished in less than a day. Vehicle interior was not marred in any way partsman were courteous ad friendly explained everything clearly and concisely. Excellent warranty and service. Vehicle was booked in and repaired within 24 hrs of making phone call to Capital. I will return to Capital for future service. Thanks. Met all expectations. Door opened upon arrival, was directed onto wheel alignment platform asked about mileage and if oil change was all I wanted, my reply was yes, Was asked if I needed a ride, advised I would wait. Was advised it would take 3/4 to 1 hour, it did, I was directed to service desk received my paper work and left. All good. David my service technician was able to get me back on the road in a timely manner on a very busy day and found a special program that covered the cost of my service call. Got a call to offer service to get winter tires on and beat the rush. Thought it was a good idea. Time for an Oil change too. Bring on winter! 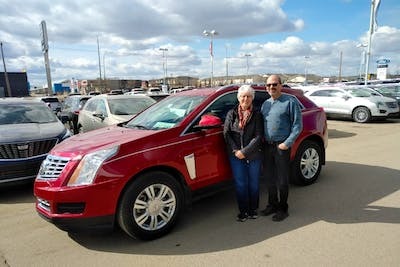 "Great Experience, worth the drive from Saskatoon"
I purchased my vehicle at Capital GM and brought it back for its first service and glad I did. The service department was fantastic to work with , they communicated with me on every aspect of my service requests and made sure I was informed as to the status of my vehicle. Not to mention Gregg in sales made sure I had a vehicle to use while mine was being looked after. Great service... it’s good to know that there is a dealership that takes their customer service seriously and Capital GM takes it to next level. I was from out of town and I was provided a loaner while my Cadillac was in for maintenance and minor warranty work. I truly appreciated this to be able to run errands rather than waiting. I was kept informed of any findings.